Rosalind Withers (pictured with Alex) is daughter of photographer Ernest Withers, famous for his images created during the civil rights era. You may recognize the gentleman on the right in the photo we are holding. I photographed Ms. Withers for a publicity shot as she will be placing some of her father's images on a rotating display at the Crescent Club. We had a nice conversation about the extent of the collection, enjoyed a little "shop talk," about the conservation photo printing methods to keep his collection preserved. It was fun getting to know her a bit as I even got to view some personal family and grandkid pictures. Sadly, Ernest Withers passed away in 2007 at the age of 85. According to the New York Times, "Mr. Withers had the largest catalog of any individual photographer covering the civil rights movement in the South, said Tony Decaneas, the owner of the Panopitcon Gallery in Boston. The galley is the exclusive agent for Mr. Withers." From Withers' obituary published in the New York Times. "Not only did he document civil rights history," Decaneas said, "he was the epitome of a fine-art working journalist." Mr. Withers documented Memphis's bustling Beale Street blues scene, making both studio portraits of up-and-coming musicians and going inside the clubs for shots of live shows and their audiences. He photographed B. B. King, Aretha Franklin, Ike and Tina Turner, Elvis Presley, Ray Charles, Sam Cooke, Isaac Hayes, Otis Redding, and Al Green, among others. 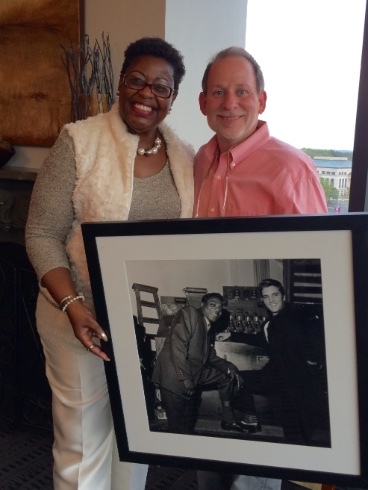 In 1956 he photographed a young Mr. Presley arm in arm with Dr. King at a Memphis club.